A bunch of people are testing it out Patchoo and directing comments and feedback to the thread on JAMFnation. It would be best if you can start throwing issues and requests directly into Github project's issue tracker. That way I can track and nail down bugs, and fix the wonky bits of documentation. And now on the the planned changes before I bounce it to 0.99. Just as I released it and completed the docs, I realised that one of my grumble points from an admin workflow was the fact we had to manually pass parameters to the --cache mode and tell the script which pkg was being cached. Can we remove this? Yes, we can! We shouldn't be parsing ls I know.. this will return the newest pkg addition to the Waiting Room. If run directly after a pkg cache, and then we check against existing patchoo pkgdata metadata, this should be pretty robust way of locating what has been cached.. without telling the script directly. Now, how do we get a friendly name for UI? 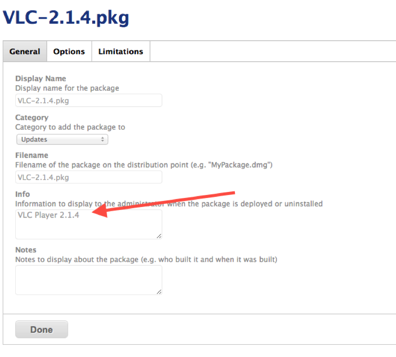 Then we just query the JSS, pull down the pkg info, then parse out the pkg info https://github.com/patchoo/patchoo/issues/3 A friendly Name for your App 14.21 can be entered into the jss via Casper Admin as you import your packages! 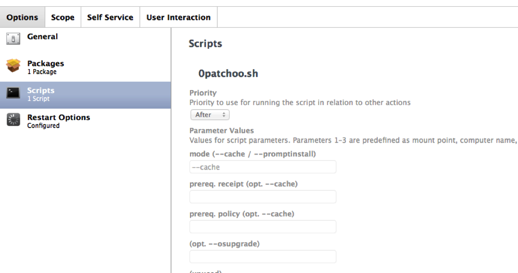 Now a pkg deployment / caching policy only requires that you add 0patchoo.sh --cache and set it to Run After !